La Martiniere (Constantia) was built by Frenchman Claude Martin (1735-1800) in 1795, though he died before its completion in 1802. 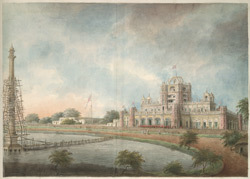 This example of European architecture later influenced the developement of hybrid Indo-European architecture in Lucknow in the 19th century. Initially designed as a country house, it is used as a school for boys. A closer view of Constantia from the north side of the lake, with General Martin's monument on the left. Inscribed below: 'View of Constantia from the west.' 375 by 527 mm.